I studied the traditional way. When I was in school, there used to be a blackboard, a teacher and roll-top desks in the classroom. Now with the advancements in technology, education is seeing a 180-degree shift. The teacher-centered approach is fast diminishing in relevance as more importance is thrust on student-centered learning. Teaching that once took place within the confines of the classroom is now moved online. In the flipped classroom method, class time is spent on discussion and in-class assignments. This approach calls for educators to either record their video lectures by making use of online video tool. The study also says that students are more likely to watch videos as opposed to reading a text. With an increase in access to electronic devices, students can now whip out their phone or laptop and watch lectures. Why Should Teachers Use Videos In The Classroom? Videos are the hallmark of flipped classroom methodology. Using videos in the classroom reaches children with a variety of learning styles. Be it visual, aural, physical or verbal. Motivates and engage students by allowing them to learn at their own pace. Video allows teachers to save hours of repetitive teaching. Help mitigate cheating and bring out the creativity in every student. Teachers can use videos to give personal feedback on student’s work instead of being verbal. Students can re-watch videos anytime and anywhere when absent or during exam revision. How Can Videos Help Students In The Classroom? Students learn better when they understand a concept on their own. Students watch video lectures and learn independently or create videos to explain a topic to their peers. Videos help students ‘learn by doing’, and because of this, a student’s ability to remember a topic improves. Students can apply their video skills outside of the school too. Using digital technologies like videos inside the classroom amplifies student learning abilities and augments memory retention. Videos keep the students engaged longer and actively involved throughout the lesson. Engaged students participate more in the class, are less distracted, and retain what they’ve learned longer than those who weren’t participating enough in the class. Since video assignments are mostly a part of group activities, it allows students to help their peers and teaches them how to work collaboratively. For many teachers, flipping the classroom begins with live recording their lectures. Sending recorded lectures to students allows them to pause and rewatch if they didn’t understand it the first time. With recorded lectures, students will be able to pause the video, rewatch the lesson multiples times according to their learning pace and needs. You don’t have to record lectures inside the classroom alone. You can record your lectures and share them with your students anytime and from anywhere. Recording lectures before the class can help you close the gap that might result from your absence sometimes. If you are planning a vacation or experiencing prolonged illness, you don’t have to worry about missing the classes. With pre-recorded lectures, you can keep the class running even in your absence. With the help of a video tool – you will be able to walk in front of the webcam, press record, and start lecturing. A lot of teachers like you must have tried recording their screen in an attempt to lecture. It’s an entirely popular means of creating videos among teachers around the world. If you’re one who knows nothing about screen recording, here is what it is. Screen recording lets you record everything with/without audio that appears on your screen. It allows you to create mini-lectures by narrating over the screen. Recording your screen is a piece of cake now with the advent of browser-based video tools. With such tools, you will be able to create professional screen recordings and share it with your students instantly. Screen recording videos are created especially for hard-to-grasp concepts so students can view them multiple times. It saves you valuable class time and helps engage your students in the classroom. As you explore better ways to increase the engagement rate between students and teachers, recording video presentations can be a good choice. Effective presentation and communication skills that students develop in school are among the most valuable assets they take into the workplace. Instead of driving students to work on a quiz or exams, you could ask them to create a video presentation on what they’ve learned. And with the rate at which educational technology is growing, creating an excellent video presentation is faster than ever. Video presentation helps the student think creatively. It helps the student express their opinion verbally and prepare bullet-point notes instead of keeping it writing focused. It helps the student overcome the anxiety of public speaking in the long run. Forget about writing essays, reading assignments and other types of ‘homework’. Video assignments are the way to go. Asking students to do their assignments in the form of video can help them immerse themselves in a topic deeply and naturally. Video assignments make students work collaboratively. It exhibits student knowledge and effective communication skills. What kind of video assignments can students create? Ask students to find web videos that talks about the same thing discussed in class. Then ask them to create their video version of what they learned. This makes students think out of the box and get a diverse knowledge on the subject. Instead of asking students to write assignments, ask them to create a video instead. This will help them learn how to use digital technologies and use them to present their original thoughts. Asking students to record a spoken essay instead of a written assignment can be useful as well. It helps a student become effective communicators and prepare them for the real world. Which Is The Best Online Video Tool For Video Creation And Video Editing? There is a wide range of online video tool for video creation and editing tools available that you can use to quickly create and edit videos. With PowToon, you can create animated presentations and videos. Using animated presentations in the classroom allows teachers and students to engage, explain and tell a story with impact. Powtoon has ready-made templates designed to start creating animations by just dragging and dropping the ones you like. It also provides you the opportunity to customize the templates and design your own with images, music, and voice-overs. The drawback in using Powtoon is that you have to upgrade to use all of the templates, and backgrounds. With the free version you have access to basic features and it comes with a watermark. Hippo Video is an all-in-one online video tool for education. It takes care of the entire life cycle of video, from creating, editing, hosting, sharing to tracking. It contextually integrates with Google Classroom, Google Slides, Google Docs, Gmail, and Desire2Learn LMS. You don’t have to upgrade to get these integrations. When you sign up for Hippo Video, all the integrations come along with it. You can choose between webcam, screen record, and an audio option to start recording. Or import your videos from anywhere and start off with video editing. You can also make use of the Chrome Extension to record and narrate over your screen. Hippo Video has a quick video editor that lets you trim clips, cut, and crop videos. You can also add text, emojis, and callout to give your videos more context. It lets you add unlimited audio and video tracks, adjust clip setting, and callouts just like any professional video editor. Add introduction and end cards to the video too. Point it out right from versatile markup options like highlight, focus, erase, pause and play to find those perfect shots. Supports editing in Chromebook for the benefit of educational users. Set privacy and password to protect your videos. Grant only necessary video access to students. 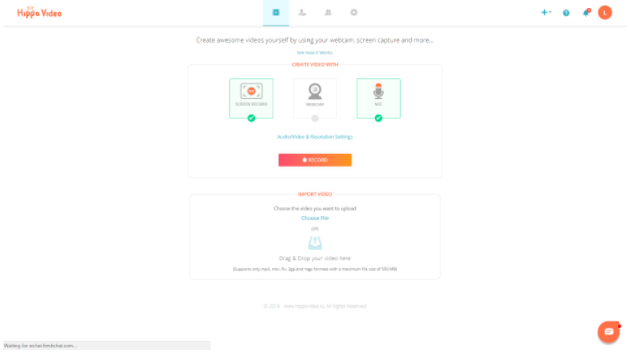 Offers guest video recording link that lets anyone record a video without even signing up. Students can quickly record a video assignment and send it to you for review. You could see the stats on how many students have watched your videos and also how it is performing on different channels shared. Video created will be available to the whole class and stored on the cloud. You can handle user permissions as well. Both teachers and students can now add a text comment or record a video and post it as a comment on videos. You can also react to the videos with emojis. Turn your short videos into GIFs instantly. With Animoto, you can turn photos and video clips into videos and slideshows. You can choose from ready-made video styles then add music, text and convert them into videos. Teachers use Animoto to create ads for school fundraisers, event recaps, social media posts, newsletters, and announcements. In class, students can create photo essays, book reports, student portfolios, or other projects. The downside is you can’t share or download the videos you created unless you upgrade. And the sad part is, it’s pricey. Flixtime is a free site where users can create custom, production-quality videos with images, videos, and text. With Flixtime, you can create, share and download a 60-second video for free. Flixtime uses AudioMicro to provide users with a selection of award-winning tracks, sound effects, and stock music. All Flixtime video productions can be used for both personal or independent commercial use. 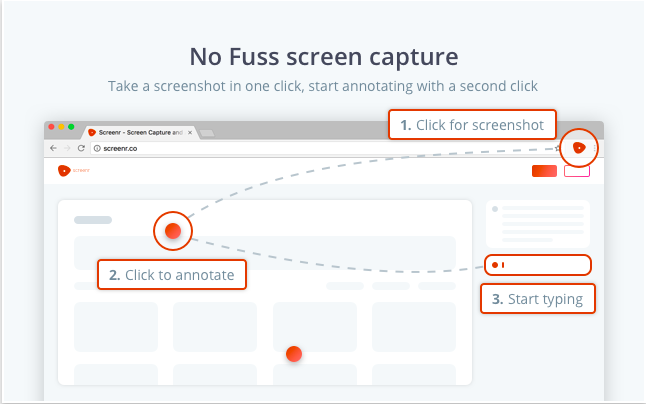 With Screenr, you can screen capture and annotate easily. Instead of pointing out what you want to convey with arrows and highlighters, type your comments on the side panel next to the screenshot and share them. It supports PNG format. Once the annotation is done, you have to upload your screenshot to get a shareable link.